There's something inherently intimidating about violin lessons. 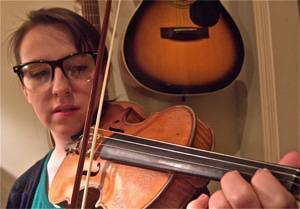 Maybe it's the centuries old tradition of obsessive virtuosos, or maybe it's the delicacy of the instrument itself, but whatever it is, parents often feel at a loss when one of their children expresses interest in violin lessons. We're here to help. Trust us. It's not as scary as it sounds. 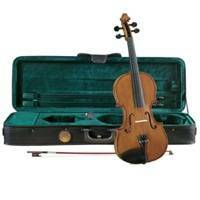 For beginners, we recommend the Cremona SV-175 Premier Student Violin, Full-Size. These are quality, low cost violins. If properly set up, it will keep your young violinist happy for years. It comes with a case and a bow. Don’t feel bad about buying an instrument online. If you don’t know anything about violins, it’s probably a better option than buying one from a violin shop. A beginner needs to develop skills, knowledge and personal preferences before he or she can make an informed decision in a violin shop. Until that day comes a good quality inexpensive violin is exactly what she needs. One of the first things you should do when you get your new instrument is to take it to a violin shop and have them adjust it. They will make good recommendations on what you can do to improve the sound and playability. Cremona violins tend to come out of the box with low-quality strings that ride too high on the violin, making them harder to press down, especially for beginners. Fortunately, this can be adjusted very inexpensively. As we've said in previous bog posts, success in music depends on human connection. Private violin lessons are great, but just like sports, it takes more than a single person (or coach) to capture a young mind. Get your child enrolled in a program that, in addition to violin lessons, provides opportunities for group collaboration and performance. Music House School of Music, with locations in Lenexa and Overland, is your best bet. Click here to find out more about Music House.